If youâ€™ve been following my blog, you know about Running America, as well as my invitation to be part of the adventure and documentary film. You know about Charlie Engleâ€™s injury, and his decision to support his teammate, Marshall Ulrich, by getting on a bike to close the gap of almost 200 miles, catching up to him near Sterling, CO last night. Charlie is adapting to the situation at hand, and staying true to his mission of awareness and fundraising for United Way. Heâ€™s also staying true to his buddy Marshall, and doing whatever he can to give Marshall the best possible chance of breaking the current record of 46-days to run across America. You also know that Iâ€™ve been completely sucked into their adventure, living vicariously through their blog posts, and staring at their GPS dots on the map, secretly hoping that maybe if I stare long enough, Iâ€™ll magically get sucked through cyberspace and find myself on the road with them, running along in support. Thereâ€™s obviously something about what theyâ€™re doing that I find extremely compelling, and it stirs that part of me thatâ€™s been there for a long time. That part of me that got me into this 50-in-50-by-50 marathon project. That part of me that was addicted to watching the Discovery Channel Eco-Challenge for years (meanwhile, Charlie & Marshall were racing in it), dreaming of someday being able to participate. Itâ€™s also that part of me that is obsessed with Mt. Everest, and the very, extremely, almost non-existent possibility of one day climbing it. So, if you know all that, you werenâ€™t surprised to learn that after a memorable and meaningful trip to Sacramento, CA, to officiate the wedding of Robert and Jenn on Saturday, October 4th, I flew home Sunday morning, and was quickly out the door again. With the help of the Spot technology used by Charlie and Marshall, I figured I could intercept Marshall somewhere around Sterling, CO, maybe just west of there, and could run with him however far heâ€™d let me (or however long I could keep up). I knew they werenâ€™t filming this stage, and I had missed my opportunity to be in the documentary with them, but it was less about that for me, and more about just wanting to have a taste of their adventure. And, I thought maybe the company might help him out somehow too. So, hereâ€™s what happenedâ€¦and itâ€™s a loooong blog post, get comfy. My plane landed in Denver just before noon. I drove home, trying to decide if there was some reason I shouldnâ€™t start this Marshall-chaseâ€¦and I could only come up with reasons in favor of the idea. Arriving home, I was met with incredible support from Bethany, who I think knows I had to do this, or Iâ€™d regret missing the opportunity. So, after grabbing some food, stuffing some things into a backpack, and putting my bike on my car in a last-minute decision, I was on the road around 2:30pm. I originally decided the bike might be a good idea, because I figured that once I knew where Marshall was, I could drop my bike off 10 or 15 miles ahead of him, and then drive to his location, park the car, and join him on the run. Then, when we reached my bike later on, I could bike back to retrieve my car. However, the universe had other plans for my bike, which I didnâ€™t know at the time. With help from my dad in New Jersey, relaying Marshallâ€™s GPS location as posted on their website, I learned that I had arrived at my intended destination too late to intercept Marshall. I was at the intersection of CO-14 and CO-71 about an hour west of Sterling. Marshall was running east on CO-14, and by my best guess, would be ending his day somewhere near Sterling. But Marshall had run by the spot where I sat in my car about 90 minutes earlier. His dot on the map hadnâ€™t moved in about an hour, and was located at a hospital in Sterling. Uh-oh. Bad news. After driving the rest of the way into Sterling, hoping to find Marshall and his crew in the parking lot of the hospital, I came up empty again. No Marshall. No crew. No RV. Nobody I talked to had seen him or knew anything about what I was talking about. The locals I asked at the Wendyâ€™s nearby looked at me like I was crazy when I explained what was going on. I finally reached my wife Bethany on the phone, who also helped by checking online for Charlie and Marshallâ€™s GPS locations. It showed Marshall was still at the hospital, so I guessed that his transponder had been turned off. The last ping from it was now over 2-hours old. Charlie was still riding strong, now coming into a small town called Buckingham along CO-14. A nice, 86-year-old guy, dressed up for Sunday dinner at Wendyâ€™s, informed me that Buckingham was about 90 miles westâ€¦and that he hasnâ€™t been there for about 25 years, since he bought his new car near there. So, I chased the next reasonable possibility. Maybe Marshall really was injured, and was now driving in the RV back towards Charlie, 90 miles away. Back in my car, chasing again, I wondered if all of this was a royal waste of time, gas, and a precious Sunday afternoon with my family. I didnâ€™t know how it would end up, but I knew that since I made it this far, I might as well try one more time to at least catch a glimpse of themâ€¦even if I found them stopped for the day. I suddenly noticed I was going about 95mph. It was now starting to get dark too, and off in the distance I could see some thunderstorms approaching. About an hour later, I saw a small RV pass me heading west, and a mini-van behind it. There werenâ€™t many cars out here in the middle of nowhere, so I half-wondered if that might be one of the Running America RVs. 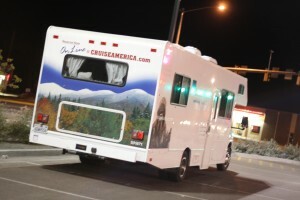 I caught myself in the assumption that the RV for this adventure must be huge, and plastered with sponsorship logos. I figured it would be obvious when I saw it. I was wrong.Â It was a rented RV, nice enough, just not what I expected. Up ahead, after coming over a rise about 8 miles ahead of Charlie, I saw the RV and mini-van I had seen before. They were parked in the grass off the road, RV lights shining like a beacon for Charlie in the middle of this dark and remote farming area. I pulled up, and introduced myself, offering to ride with Charlie, but really not wanting to hamper their operation in any way. The crew (Chuck, Jen, & Dave) were extremely welcoming, friendly, and seemed glad that Charlie would have a riding partner for his last 20-or-so-miles to Sterling. They also hadnâ€™t received any information about Marshall yet, but seemed concerned. So, I started getting ready at my car, taking my bike off the roof, swapping my running shoes for my biking shoes, and putting on a long-sleeve top with a reflective vest on top of that. Then I realized I didnâ€™t bring a water bottle to fit on my bike. So I threw on my backpack, in which I had a bottle of Gatorade. Chuck came over to my car with a headlamp, and offered it to me. Dave also offered to take my keys and drive my car, so I wouldnâ€™t have to come back for it. Meanwhile, I pulled my bike pump out (I had thrown it into the back of my car, almost as an afterthought before I left) and started to top-off my tires, which were a bit soft. A popped-off cap on the bottom of my pump meant I had to plug the hole with my thumb while pumping with the other hand. Both Dave and Chuck took turns squeezing onto the hole in the pump while I worked the air into my tires. Suddenly, I was beginning to feel guilty that I was causing them to â€œcrewâ€ for meâ€¦in addition to Charlie. But they quickly reassured me by joking around and saying they just were glad to be useful. I had a quick flash in my mind of playing with my 3-year-old and his trains, and how they all like to be called â€œreally useful enginesâ€ in his Thomas-the-train videos. Still fiddling with my backpack, and trying to get the headlamp to stay on my helmet, I suddenly realize that Charlie is standing behind the RV now. I donâ€™t know how long he has been standing there, waiting for me, so I quickly head over to himâ€¦and heâ€™s already ready to go! I decided to ditch my backpack (it was covering my reflective-vest anyway, making me less visible to traffic from behind), I gave-up on the headlamp, and we headed out. The crew had been leap-frogging with Charlie, going ahead and stopping every 10-miles or so, and they drove ahead once more, my Subaru bringing up the rear of their caravan, until they were out of sight beyond the gently-rolling hills ahead of us. It was suddenly very dark, despite an amazing sky of stars and crescent moon, and I kinda wished I hadnâ€™t given-up on that headlamp. But, I wanted to ride in front, blocking the wind for Charlie, so I was able to see from his headlamp behind me. He also had a flashing light on his back, making us both easier for cars to see (though there were very few of them). And here I was, riding along with Charlie, an elite professional endurance athlete, some 1300-miles into his incredible journey, talking like we were old friends. While I wanted to hear all about his adventures, he seemed very interested in my storyâ€¦especially in swapping kid stories, dog stories (we talked for a long time about the recent loss of my dog Veya), and our shared addiction to endurance sports. We talked about his time in the Eco-Challenge races, and about Mark Burnett, now his friend, who had created and organized the race from his garage for several years before getting support from Discovery Channel. The Eco-Challenge doesnâ€™t happen anymore, and Mark has since moved onâ€¦now heâ€™s the creator and host of Survivor. We talked about his kids, and his niece, who is an amazing up-and-coming runner recruited by University of Colorado-Boulder. Sheâ€™s currently a high-school senior, running 4-and-a-half minute miles! Our ride was fun! The road had a decent shoulder, though there was hardly a car out there. At one point, we were flying down the backside of one of the rolling hills, with the road to ourselves, like kids who had found a good hill to ride with their skateboards. I released my intent gaze on the pavement (with no headlamp, I was constantly straining to detect a pothole before my bike did, especially cruising around 20mph down this hill), and I allowed myself to look up. The clouds were breaking up and revealing an incredible starry sky. It was completely quiet, except for the buzz of my knobby mountain-bike tires on the pavement (Charlie had swapped his knobbies out for some slick road-tires earlier in the day). I looked over at Charlie, and he was looking up too. It was a pretty cool moment, and really the only break in our conversation during our whole ride, except for a couple of brief pauses as a huge truck passed us and we couldnâ€™t hear each other anyway. Although it seemed we had just started our ride together, we suddenly found ourselves pulling up to the now-familiar lights of the RV, mini-van, and my Subaru. We had already covered 10-miles. Charlie said, â€œOK, time for a bathroom break,â€ and hopped off his bike. I hopped off mine and grabbed a quick drink from the back of my car, placing a quick call to Bethany with an update since there was a cell signal here. Then I went back to my bike, ready to head out again with Charlie, only to find my back tire was almost completely flat. Uggh. In my haste to leave the house, I didnâ€™t really prepare myself well for the possibility of biking. I didnâ€™t have my headlamp, I didnâ€™t have my water bottle, and I didnâ€™t have my seat-pouch with my flat-kit and spare tubes. My ride was done, after an impossibly quick 10-miles. As you would expect him to respond, after his own trials and tribulations during his journey so far, Charlie just laughed it off as yet another hiccup of the journey. Then he said, â€œOK, well Iâ€™ll just see you at the next stop then,â€ and he headed off on his bike. The crew waited for me to load up my bike on my rack and said they were going to stop for the night in Sterling, after Charlieâ€™s final 10-mile stretch. I started up my car and fell into the caravan behind the RV, noticing all of the sudden that my â€œcheck engineâ€ light was now illuminated. Awesome. My car made it the final 10 miles without incident. Waiting for Charlie in a Walgreens parking lot in Sterling, I now had a chance to connect with the crew: Chuck, Dave, and Jenâ€¦all amazing people! Dave plays in a softball league for the deaf (he can hear a little, and we were able to communicate a little bit), and he has also completed 15 marathons â€“ just this year! Chuck has a long list of adventures too, including serving as Charlieâ€™s crew for the Badwater Ultramarathon for several years. He is an ex-cop, ex-Air-Force guy, who is now a personal trainer and massage therapist. He was also with Charlieâ€™s expedition to run across the Sahara last year. And Jen just happened to meet Charlie, in Greensboro, NC, where they both live. They were both at a track, doing some training, and next thing you know Charlie was asking her to come along on their adventure. Jen is an Emergency Medical Technician, who is also gearing up for her first marathon later this month (sheâ€™ll rejoin the crew when sheâ€™s done). 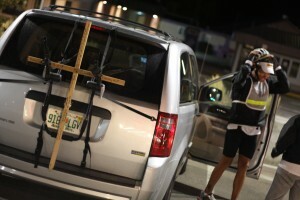 Here’s a pic of the mini-van, and that’s Charlie’s cross that he stuck in the ground at the spot he stopped running back in Utah. We soon saw Charlieâ€™s headlamp coming into town, and were acknowledged by Charlieâ€™s child-like squeeze-horn he has on his bike. It was cause for a quick laugh, and it kind of captured the spirit of their adventure. Although Charlie was definitely hurting, not just physically, but perhaps more emotionally around a sense of failure, for not being able to run, here he was finding ways to be positive anyway. I was starting to see Charlie as the Patch Adams of endurance-racing, if only for today. Despite their challenges, theyâ€™ve adapted, and found a way to keep spirits high and the journey fun. Charlie pulled into the parking lot with a smile on his face and a spring in his step, despite saying his fingers were frozen. Itâ€™s funny, I hadnâ€™t noticed the temperature had dropped when we were riding together, but I looked down at my hands at that moment. They were red, and suddenly I felt the cold too. Chuck offered Charlie a Barqâ€™s Root Beer, and Charlie, declining the drink, then asked me if I was coming with them to the hotel. â€œThereâ€™s plenty of room, plus weâ€™ve got space in the RV too.â€ I suddenly felt like I had become part of the team, and he was fully expecting me to continue riding with him in the morning. After my initial reaction that wanted to say, â€œYep, Iâ€™m with you from here to New York!â€, my brain got the better of me, and I had to decline. I just couldnâ€™t do that to Bethany, who had been alone with our kids (3y/o Garrett, and 3-month-old Gillian) for almost 3-days already due to my Sacramento trip. As much as I know sheâ€™d love for me to seize an opportunity like that, I also know she might have to send headhunters after me if I continued on with Charlie. Better to avoid that altogether, I thought. Anyway, I had done what I set out to do. I found Charlie, I got a small taste of â€œRunning Americaâ€ (10 miles biking, 10 miles driving, plus about 400 miles chasing and searching), and I threw another log on that fire inside me. Time to get back to some marathonsâ€¦at least until â€œRunning America 09â€ begins! As a beat-up pick-up truck rumbled by, with a guy in the back yelling, â€œhey, wanna rumble?â€ at us, we took some pictures together, and they headed off. Not wanting to be in the parking lot if that pick-up truck had turned around, I headed home too as it started to rain. 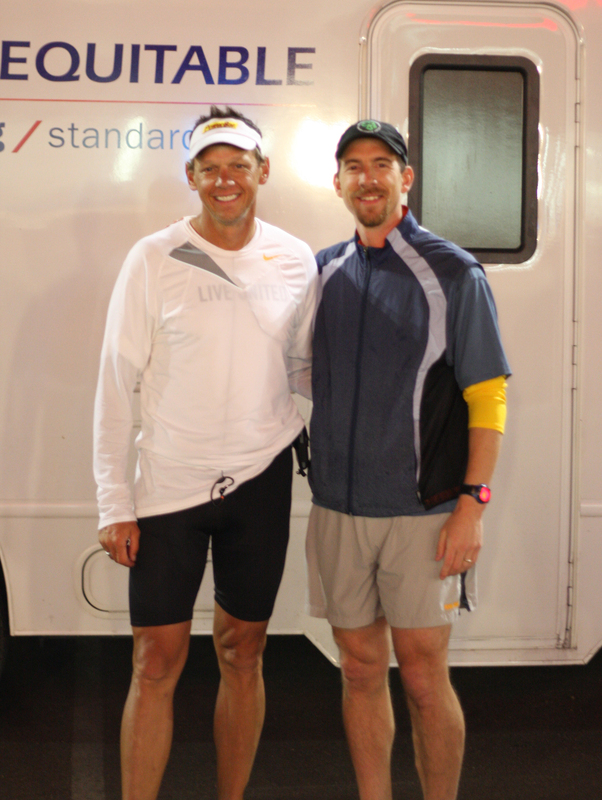 Thanks, Charlie, and crew, for sharing your experience â€œRunning Americaâ€ with me. I don’t know how much I actually helped pull you along, but it was gracious of you to allow me into your adventure. I’m honored and privileged to have been a part of it, however small. And, Marshallâ€¦Iâ€™ll catch up with you and your blue-dot next time maybe! I hope your injury is nothing serious, and I wish you the best in your attempt to break the record.